To learn even more about mussels, check out the Mussel Bed! Mussels are in the Family Unionidae, Class Bivalvia within the Phylum Mollusca. Mollusks are a diverse group that might not seem to be related. Mussels are cousins to the squid, octopus, nautilus, snail, and slug! Unionid Mussels (also known as naiades or freshwater mussels) have bilateral symmetry. The two shell halves (valves) are identical in size and proportions, and the only difference between them is where the shells fit together. The valves typically have two kinds of interlocking structures that serve to hold the shell together and protect its resident: lateral teeth and pseudocardinal teeth. The exact shape and size of these structures are important in keying out species. The area between the teeth is called the interdentum. Collectively, these three features are the hinge. Kansas has a great potential to experience huge economic and ecological losses as a result of zebra mussel infestations. Mussels can move, but very slowly! They have a muscular "foot" that they can protrude out between the valves, wedge into the substrate on the stream bottom, and then contract to pull the animal a short distance. Mussels can use this method to either move sideways or vertically. Some mussels can be fairly active. Other species may spend their whole lives in one spot. One fun thing to do is look for the mussel trails of the "frisky" types in shallow water. The trails resemble squiggles you might draw squiggles with a stick. If you follow the trail, you will find the animal at one end or the other, usually in a small depression. Most species of mussels have a parasitic stage of life that requires a host fish. Eggs develop within the female mussel in a specially modified gill pouch called the marsupium. They are released as a larval form called glochidia, which must attach themselves almost immediately to either the gills or fins of the proper species of fish. This apparently does no harm to the host fish. Some unionids may use more than one species of fish as a host and others only a single species. One notable exception is the Salamander Mussel (Simpsonaias ambigua), which uses a type of salamander called the Mud Puppy for the host instead of fish. Also, at least one species of unionid does not have a parasitic stage. The glochidia mature into juvenile mussels, burst out of their cyst and drop to the bottom to begin their adult life. This is the principal means that unionid mussels use to disperse into new territory. They have no other way to move upstream in a watershed, other than by the slow creeping action referred to above. Several species of mussels have interesting methods for getting a fish close enough to ensure they will be infected with glochidia. Some wave a lure called a mantle flap, which usually looks like a small minnow, but in one species it resembles a crawdad! When a predator fish tries to nab what it thinks is a meal, the mussel squirts a bunch of glochidia into its mouth! Others carry deception a step further. They form their glochidia into gummy little packets that look like tiny fish or aquatic insect larvae and release them into the water. These packets are called conglutinates. When a predator fish tries to eat this decoy, the conglutinate ruptures in its mouth, releasing the glochidia. The ultimate in mussel trickery is called a super conglutinate! This is made up of dozens of conglutinates formed into a larger shape that are attached to the mother mussel by a long mucous ribbon, which allows it to wave back and forth in the water - just like a fishing lure on the end of a line! The tightly packed rows of conglutinates bear an incredible resemblance to the segmented appearance of some kinds of minnows. Any fish that chomps down on one of these will REALLY get a dose of glochidia! This photo shows the super conglutinate lure of Lampsilis perovalis, the Orange-Nacre Mucket. It even has a lateral stripe and a "head!" You can see more pictures, and a video of it waving in the current, on Dr. Chris Barnhart's Missouri State Unionid Gallery. Mussels are filter feeders. They pump water through themselves using two tubes called siphons. As the water passes through the mussel, it gets oxygen and food. As the water leaves, it carries away waste products and (in season) sperm and glochidia. The siphons are located at the posterior end of the shell, which is at the end opposite the pseudocardinal teeth. 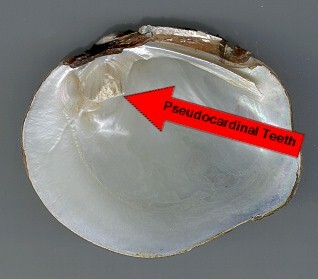 (The anterior end is the one closest to the pseudocardinal teeth.) Mussels will always seek to orient themselves with the posterior end sticking out of the substrate so they can use their siphons properly. Mussels may live over 100 years, although most live 20 to 30 years. Generally, the thinner-shelled species live shorter lives, although they grow quicker. Mussels are declining in North America. Of the ~300 different species of mussels in North America, over 44% are either extinct or in serious decline. In Kansas, the figure is 60%. No other class of animal or plant is in as much trouble. As with most types of wildlife, habitat loss is the main problem. Channelization and gravel dredging disrupts or eliminates the bottom substrate where the mussels live. Excessive siltation from soil erosion smothers them. Altered flow regimes below dams de-stabilize the natural continuity of bottom substrates. Withdrawal of water from rivers for irrigation and other purposes can cause the rivers to go dry. Damming a river into a lake or reservoir limits the number of mussel species that can survive there. Water pollution harms mussels, although the impact is hard to quantify. They can be poisoned outright--just as fish can--by large doses of pollution. But there are probably more subtle impacts through disrupting the reproductive cycle and killing off the fish hosts of their glochidia. Overharvest for human use has contributed to their decline in some cases. Many species of mussels were harvested heavily in the early 1900's. Their shells were used to make buttons for clothing. This harvest was unregulated and many species of mussels were severely impacted by it. This business ended after the 1940's due to the invention of plastic buttons. Commercial harvesting began again around 1960. This time the thicker-shelled species were the target. Their shells were cut up and used as nuclei for cultured pearls. This market lasted through the mid-1990's. Most states attempt to regulate this harvest through size and catch limits, but enforcement of the regulations is often difficult. The market has fallen off in recent years in part due to the use of synthetic nuclei. In certain areas mussels are overharvested by people hoping to find freshwater pearls. 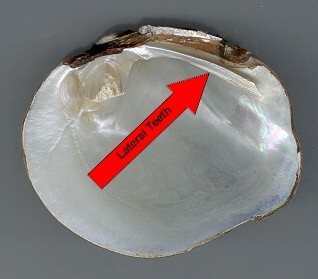 Few species of mussel produce pearls and most of the pearls produced are of poor quality. In addition, the incidence of freshwater pearls is very small even in those species that are known to produce them (less than 4% at best). Consequently, vast numbers of mussels are slaughtered for a very few pearls. Some attempts have been made to culture freshwater pearls--with modest success--so hopefully this sustainable method will replace the extremely wasteful and illegal wild harvest. (Dreissenia polymorpha) is NOT a unionid mussel. It is a dangerous new invasive species in North America. While less than an inch in length, it has a tremendous reproductive rate and apparently no significant natural enemies in North America. It's larvae are free-swimming and do not require an intermediate host. They will attach to any hard surface, even each other. Note the baby zebras that were growing on the adults in the picture to the left. They are capable of completely obstructing water intakes at power plants and can smother native mussels by growing all over them. 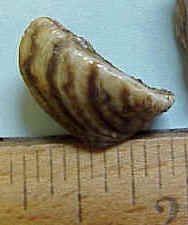 Unfortunately, zebra mussels were discovered in Kansas in El Dorado Lake in August 2003 and in Winfield City Lake in December 2006. It is essential that anglers, boaters and anyone else who engages in water sports in these lakes - or any other body of water that is infested with zebra mussels - exercise the utmost care to keep them out of other watersheds. Family Sphaeriidae, are also NOT unionid mussels. These are very small bivalves (<20 mm.) which are often found in streams. They are related to the Asiatic Clam, and have the same arrangement of the shell teeth. About 20 species are known from Kansas. They are an important part of the aquatic food chain. (Corbicula fluminea) is also NOT a unionid mussel. 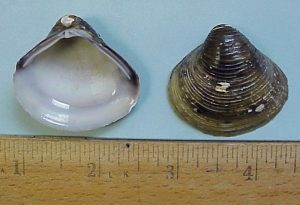 This small (< 1.5 inches) bivalve is found throughout much of North America. 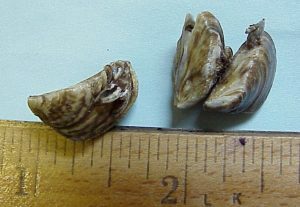 While it does not pose the same economic threat as the Zebra mussel, it does compete for food with our native species. It is easily recognized by its triangular shape and by having lateral teeth on both sides of its true cardinal teeth. There are 48 species of mussels recorded from Kansas. Click on the species name in the list below to see detailed range maps, habitat, and life history information for each. The list is based on "A Pocket Guide to Freshwater Mussels," 2008, by Edwin Miller, Karen Couch, & Jim Mason. It may be picked up for free at the Great Plains Nature Center or ordered through the mail. Species portrait web pages have been done for Washboard, Western Fanshell, White Heelsplitter, Pistolgrip, and Floater. The unionid species on the Kansas Threatened and Endangered Species list are also described in the Kansas Wildlife Refuge. X = Species that are extirpated from Kansas (8). !! = Species that are endangered in Kansas (7).
! = Species that are threatened in Kansas (4). + = Species that are in need of conservation in Kansas (11). The Freshwater Mollusk Conservation Society is working to raise awareness of, support research on, and advocate conservation of freshwater mussels. A classic reference for Kansas mussels is "Handbook of Unionid Mussels in Kansas," 1962, Kansas University Museum of Natural History Miscellaneous Publication # 28, by Harold Murray and A. Byron Leonard. This book is out of print but it's well worth having if you can find a used copy. In 2008, the Great Plains Nature Center published "A Pocket Guide to Kansas Freshwater Mussels," which covers all the species found in the state. How to get a copy.